How has your congregation “Listened Up” to the needs of others on a local, national, or international level over the past year? Enter the 2019 Annual Gathering Photo Contest and share your stories with us! The LCMC staff is once again welcoming photo submissions from LCMC pastors, leaders, and church members that depict how their congregation has been "in Mission for Christ" over the past year. We especially love to see photos from service projects, outreach events/activities/programs, mission trips, creative/artistic projects, disaster relief, and church planting efforts from any and all age groups within your congregation! Upload a photo, fill out the entry form, and click “submit"
You will receive a confirmation message once your photo has been submitted. You may enter as many photos as you’d like, however to ensure that we are able to communicate the story behind your photo, the entry form must accompany each submission. Due to printing requirements, time restraints, and the high volume of photos we receive each year we are unable to guarantee the publication of each and every photo submitted, however all eligible photos received by Monday, July 15th will be considered for publication in our 2019 Annual Gathering books. Hard copy books will be available at the Annual Gathering in October, and a digital edition of the book will be available on our website and in our mobile app once the Annual Gathering begins. The LCMC 19th Annual Gathering and Convention takes place September 29 - October 2, 2019 at the CHI Health Center Omaha in Omaha, NE. Our association needs your financial support. At this point we are about 9% behind of our budgeted goals. Please consider how you might support our association. We believe that the congregation is the front line of ministry. Your financial contributions make possible the training and equipping of people in the local church by our staff who come out to the congregations of LCMC at no cost. Travel, food and lodging is covered by our annual budget. Our staff offers resources and workshops for pastors, leaders and members of the local church in the local church and for the local church! Call committee coaching, conflict resolution, planting churches, developing missional thinking, discipleship, evangelism and stewardship are just some of the workshops that we offer. And every person on our staff is always ready to respond to the thousands of phone calls, emails, and texts that pour in each year! Our boards meet five times each year, and they are elected from all across the US and even beyond. They are all volunteers! LCMC provides for their travel, food and lodging. Their agendas are always packed and they take their work very seriously. Your financial contributions help us to fulfill our commitments: to our staff, for travel, and to maintain and develop our administrative resources: webpage, computers, print costs and more. Please consider how you might support our association with your financial gifts to LCMC. Tuesday, January 2: This is a day focused on confession. We have made our lives, our relationships, and even the church in our own image. We confess that the church belongs to Jesus and not to us. We gather to lay down our pride, our sin and our agenda and ask the Lord of the church for forgiveness, which He gives freely and with mercy. Wednesday, January 3: This is a day of petition. Pray for your congregation, for the pastor, for the leaders, for those who carry out ministries, for the Sunday School teachers, for the Confirmation leaders, for those leading adult Bible studies and for those leading small groups. Pray for those in hospital and nursing home ministries. Pray for all those connected to your church that they might know God’s redeeming love for all in Christ. Thursday, January 4: This is a day for vision. Pray that the Holy Spirit will again move through the hearts and minds of leaders and pastors that God’s vision for His church might be revealed and fulfilled. This is a time of prayer for renewal, revival and encouragement. Pray for God’s vision. Whether your congregation is organizing a special activity or you're simply setting aside some time for each of the three days to pray, let's come together as an association to lift one another up in prayer! Sample documents and resources submitted by LCMC congregations from previous years can be found here. Once the event has ended, let us know how your congregation celebrated Three Days of Prayer, share photos, and let us know what you thought about the experience by taking our online survey. All responses and photos submitted by Friday, January 19th through the survey linked here will be considered for publication in an upcoming LCMC news article. The Board of Trustees is pleased to announce that we have a Coordinator for Pastoral Ministry! Pastor Perry Fruhling has accepted the position and begins January 15, 2018. 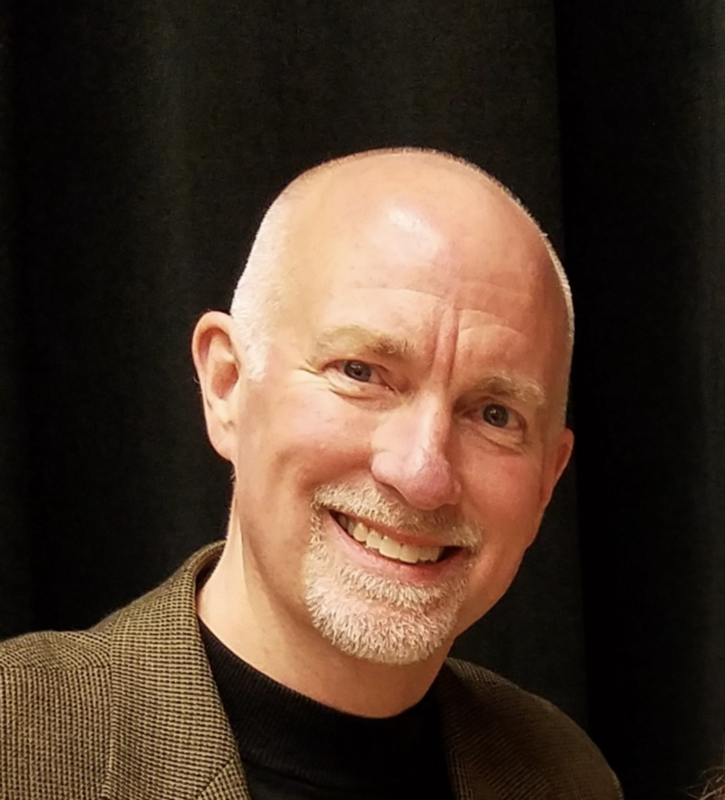 Perry has served congregations in Texas (Zion Lutheran in Fredericksburg) and in Iowa (Bethany Lutheran, Thompson; Immanuel Lutheran in Independence; and St. Mark’s Lutheran, Marion). Perry has additional training and interest in conflict resolution practices and community organizing for service in crisis. Perry brings his experience with congregations of many different sizes to this position, as well as his training, background, and passion for the Church of Jesus Christ. In his current call, with Perry’s leadership and other members of the congregation, St. Mark’s created and manages the Lutheran Disaster Assistance fund (LDA). This fund has been extremely helpful to LCMC congregations in the aftermath of natural disasters, the most recent of which were the hurricanes and forest fires that have affected millions of people. Perry’s work will focus on continuing the development of call committee coaching, call committee workshops, and the certification process. Perry will also continue the on-going training of pastors involved with certifying those who wish to be on LCMC’s list of pastors. He will work with the Ministry Board to develop leadership events and oversee our list of pastors serving in many different capacities. Perry also hopes to train and equip pastors and others for effective conflict resolution and helping our pastors to equip members for ministry. Perry is married to Marlys and they live in Cedar Rapids, Iowa. They have three children: Chantal, 26, in Cedar Rapids; Ashley, 23, in Atlanta, GA; and Caleb, 20, attending the University of Iowa. Invitations to district, regional and congregational events are always welcome! As soon as we have contact information for Perry Fruhling, it will be made available on the staff page of our website January 15, 2018. There's still time to enter our 2017 Annual Gathering photo contest before the Monday, July 17th deadline date! If your congregation has taken part in any projects, organized any events, or participated in any mission or ministry activities that exemplify what it means to be "in Mission for Christ" at a local, national, or international/global level over the past year, we're inviting YOU to submit photos to be considered for publication in our 2017 Annual Gathering Book. To learn more and submit your favorite photos, click here. LCMC has never intended to be a denomination or organization. Rather, from day one, we’ve been a movement of God’s spirit. A movement focused on working together to fulfill Christ’s great commission to go and make disciples of all nations. That’s never been easy, but it’s been on the front burner of our energy and passion since we began as an association seventeen years ago. So the Ministry Board of LCMC gladly embraced the theme of discipleship when planning the last three annual Leadership Conferences. Three years ago we gathered under the theme iFollow: Life Together in the Way of Jesus, and heard incredible insights and challenges from Reggie McNeal, author of Get Off Your Donkey and other best-selling books on discipleship. Reggie was joined by several of our own LCMC pastor-practitioners who added their real-world perspective. Last year, recognizing the incredibly challenging and changing environment in which we’re making disciples, we focused on Shift: Re-tooling Church for the 21st Century. This year 185 people gathered in Omaha as we rounded out a three-year cycle on discipleship with the theme Discipling by Design and a concentration on four areas of ministry in which every church is already engaged: worship, community, mission and leadership. The intent was to assist those present in making these things more intentionally disciple-making. Presenters were all LCMC pastors and lay team-mates who shared real-life challenges and real-life ideas about being more effective disciple-makers. 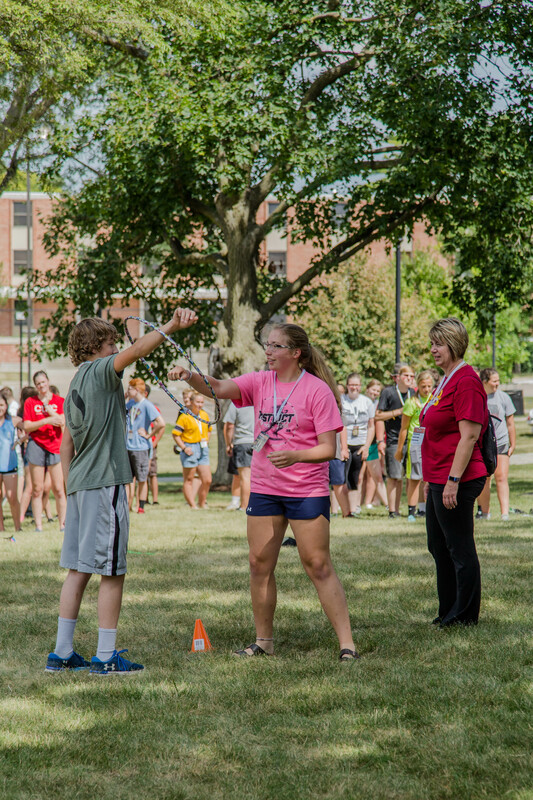 This year’s conference evaluations reflected deep appreciation for the emphasis on prayer, which was offered throughout the conference, solid and stimulating content, provocative ideas, and great connections and mutual support. They also loved the break-out processing time that followed each presentation, andmany left with specific action steps to operationalize better disciple-making! The Ministry Board thanks all who worked so tirelessly on this conference: our planning and prayer teams, speakers, worship leaders, logistics masters and hosts at Lutheran Church of the Master in Omaha: thank you for your faithful partnership in the Gospel and in making disciples of Jesus Christ! Though we love being together for this conference, the Ministry Board and Board of Trustees have decided to offer our Leadership Conference on an every-other-year basis. Stay tuned for details for our next conference tentatively scheduled for February, 2019. We have a number of congregations and ministries that have a tremendous outreach to Hispanic communities, and it would good if we could get these leaders, ministers, ministries connected. If your congregation is currently carrying out an Hispanic ministry, mission, or agency in our association, and you would like to get connected, please click here and sign up. If you are interested in learning more about developing an Hispanic ministry, feel free to sign up as well. As we get some folks on our list, we will assign a coordinator, put together a “mission statement” and see what the Lord might do with this. We have a number of non-geographic districts, and LCMC grew out of one many years ago called “Word Alone Network”. The purpose of non-geographic districts is to give people who are separated by many miles, but united in interest, a chance to connect, support and encourage, and even offer insight and training for those who want to grow a ministry. I think this network could also be a tremendous resource for those who would like to initiate a ministry in this arena. The LCMC Staff and Board of Trustees is excited to announce that today we have launched a new and improved version of our website in conjunction with our new logo and mobile app. To help make using our site a better experience for all, we have simplified our layout, made our site easier to navigate overall, and completely optimized it for use on your smartphone or tablet, so you can access the same resources and information as before in a more efficient way. Our "Find a Church" tool has also been updated, making it easier to search for nearby LCMC congregations in any area. We hope you enjoy the new look and improved functionality of our website. If you have any questions, you can always contact us. 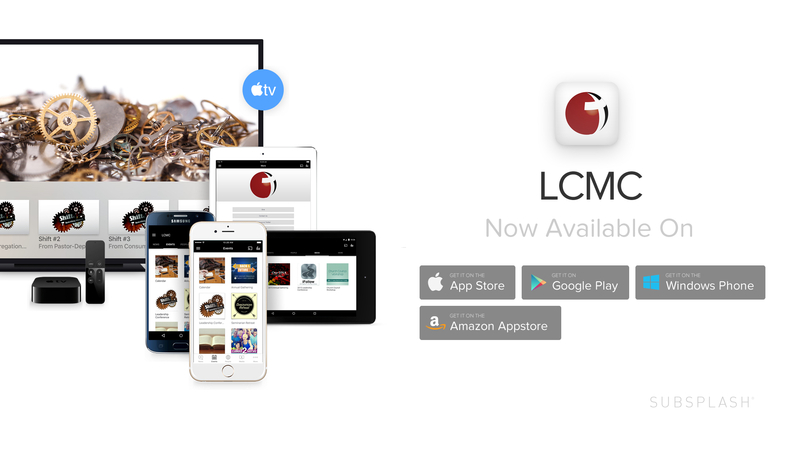 Today LCMC kicked off its 16th Annual Gathering in Denver, CO by announcing its first ever mobile app and unveiling a brand new, freshly updated logo. With the in app web player, you can catch live events, stream videos and podcasts, and even play content on your TV screen using Apple TV or Google Chromecast. The app’s built in blog reader makes it easy to stay up-to-date on recent news and announcements, and app users can also sign up to receive occasional notifications, so you'll never miss out on an important announcement or deadline again. 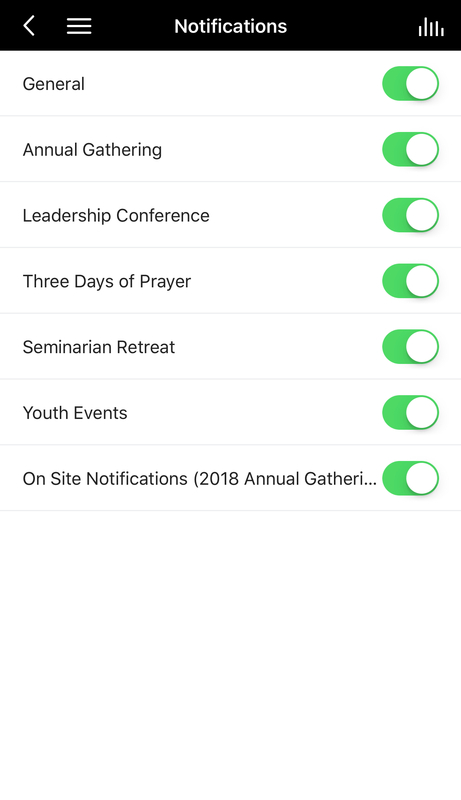 You'll also have easy access to the LCMC directories as well as the congregation search feature, so you can contact people or find nearby congregations even when you're on the go. In conjunction with the launch of our mobile app, we have also released a cleaner, more contemporary version of our logo and branding. The color scheme and design of our updated logo symbolizes our hope as an association of congregations: bringing Jesus to a dark and broken world. The red represents the blood of Jesus bringing light to the world. 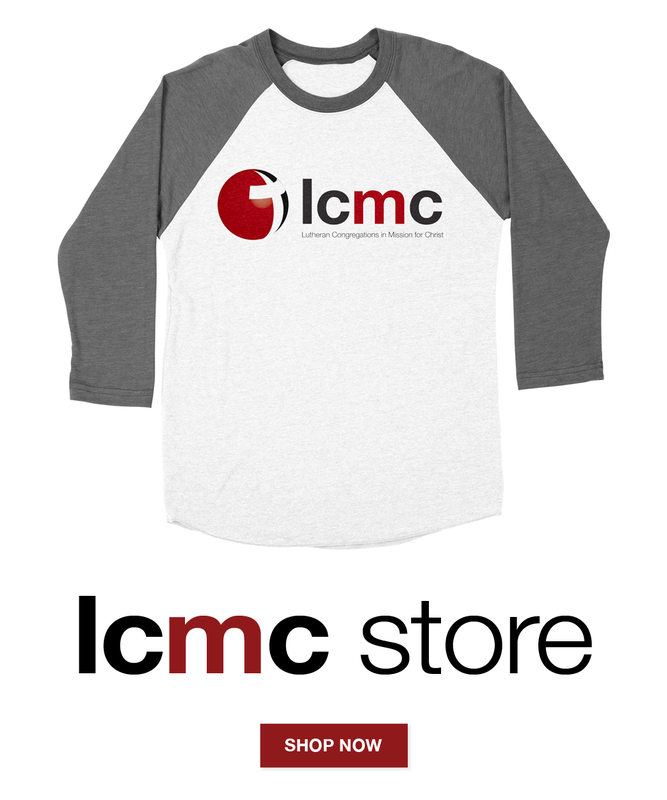 The color red in the "m" of LCMC emphasizes our focus on mission. As Lutheran Congregations in Mission for Christ, we are all working together to fulfill Christ's Great Commission in Matthew 28 to go and make disciples of all nations. A great deal of time, thought and effort has gone into creating a logo that embodies the mission and vision of our association, and we are confident that our new design will help communicate exactly who we are: a first century church for the twenty first century. Tomorrow (Monday) we will also be rolling out with a brand new, mobile friendly version of our website. To help make using our site a better experience for all, our new design will be easier to navigate and completely optimized for use on your smartphone or tablet, while still providing the same information and resources that are available today. The LCMC Staff and Board of Trustees is pleased to announce that on Monday of this year’s Annual Gathering, we will be launching a brand new, re-designed version of our website. To help make using our site a better experience for all, our new design will be easier to navigate and completely optimized for use on your smartphone or tablet while still providing the same information and resources that are available today. At this time, we will also be rolling out with an updated version of our logo and branding. A great deal of time, thought and effort has gone in to creating a logo that embodies the mission and vision of our association, and we are confident that our new design will help communicate exactly who we are: a first century church for the twenty first century. Whether you’ll be joining us in person or tuning in online via live stream, we look forward to sharing these improvements with you in just a few short weeks. The LCMC 16th Annual Gathering, themed Back to the Future: First Century Principles for the Twenty First Century, takes place October 2-5, 2016 at the Crowne Plaza Denver Airport Convention Center in Denver, CO. Early bird registration ends September 1, so be sure to sign up soon to receive the best rate! Online registration for our 16th Annual Gathering and our 2016 Seminarian Retreat is now open! The theme of our 2016 Annual Gathering is Back to the Future: First Century Principles for the Twenty First Century. Held October 2-5 at the Crowne Plaza Hotel and Convention Center in Denver, the event features plenty of opportunities to get inspired, connect with other people in LCMC and get the latest news updates on our association. This year, we'll be teaming up with Lutheran World Relief for a special service project, where we plan to assemble 10,000 personal care kits for people whose lives have been affected by natural disasters. We will also be hosting a fellowship dinner on Monday evening, giving participants an opportunity to make new friends, reunite with old friends, or get connected with a fellowship group of their choice. The event also features keynote speakers, worship services, more than 30 breakout sessions and the ability to connect with various mission and ministry organizations in our vendor area. All pastors, leaders, church members, delegates and visitors who register for the Annual Gathering by Thursday, September 1 will receive $60.00 off the cost of registration! Hosted at the Ponderosa Camp and Conference Center in Larkspur, CO the weekend before the Annual Gathering, the Seminarian Retreat gives seminary students a chance to connect with one another, connect with seasoned pastors in LCMC, and ask questions about the seminary process. Registration is $60 per person with meals and accommodations included. Spouses are also invited to attend. Advance registration is required. Videos of this year's speakers will be available at our website in winter 2016. We'll make an announcement via the LCMC E-Newsletter once our videos have been delivered, edited, and uploaded to our website, so stay tuned! For videos, books and other media downloads, go to "Events", then "Media and Downloads" or click here. This year's Annual Gathering is all about exploring and celebrating the very thing that makes us, as an association, who we are: our DNA. Whether you’re new to LCMC, just checking us out for the first time, or a long-time member looking to make new friends and reunite with old ones, our 15th Annual Gathering is the perfect place to get inspired, get informed, get equipped and get connected. Find out more about what it really means for us, as an association to truly be Lutheran Congregations in Mission for Christ by hearing from some of the founding members of LCMC. Enjoy Worship and Bible Study with LCMC-ers from all over the world. Learn more about what we have accomplished as an association over the past year, our vision for the future, and be the first to find out about news and upcoming LCMC events! Get to know some of our international members, church planters, new ministry leaders, seminarians, chaplains, pastors, staff members and more! Get in touch with dozens of LCMC’s mission and ministry partners, as well as other vendors, by exploring our vendor area. The event takes place October 4-7, 2015 at the Embassy Suites Dallas - Frisco Hotel, Convention Center & Spa in Frisco, TX (near Dallas). Earlier this month, 1,012 people from around the world came together in Des Moines, IA for LCMC’s 14th Annual Gathering. During the Business Session of the gathering, Pastors Christopher Miller (Area 2) and Kenneth “Corky” Spitler (Area 5) were elected to the LCMC Board of Trustees. Pastors Nathan Hanson and Stephan Turnbull were appointed to serve on the Ministry Board. Rev. Mark Vander Tuig announced the launch of the LCMC Prayer Chain, an opportunity for people to sign up to pray for all of the congregations in LCMC on a weekly basis. Click Here to learn more and sign up. It was also announced that our 15th Annual Gathering will take place from October 4-7, 2015 at the Embassy Suites Hotel and Conference Center in Frisco, TX. Photo galleries from the Annual Gathering, downloadable copies of our 2014 Book, and presentation notes from our Keynote Speakers are now available at our website. To view any of these materials, Click Here. Videos of our speakers will not be available until later this winter. We will announce via E-Newsletter, blog, Facebook and Twitter when these videos have been posted. How has your congregation been "in Mission for Christ" over the past year? Whether you've organized a creative fundraiser to help raise money for our meal packaging project, traveled abroad on a mission trip, or put together a program to help reach out to the people in your very own community, we want to hear about it! For the next several weeks, our staff is inviting all "LCMC-ers" to send us photos of themselves (or fellow members of their congregation) "in Mission for Christ". All photographs received by Thursday, July 31st will be considered by the LCMC Staff for possible inclusion in the design of the book that will be distributed at the Annual Gathering this October, and on our website! From 5k races to beauty treatments to English as a Second Language programs, we've seen all kinds of interesting photos and creative ideas in the past. We are very much excited to see what is going on within the congregations of our association, and to incorporate these stories into the artwork of this year's Annual Gathering book. Before you get started, please read through the requirements and instructions below. 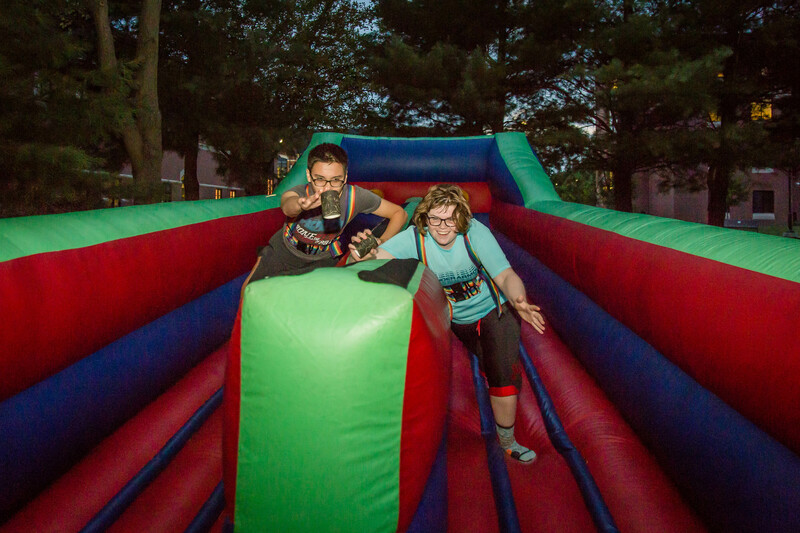 What we're looking for: Photos of you (or people in your congregation) in action! For examples of photos we've used in the past, check out some of our previous books here. Our staff welcomes photo submissions from now through Thursday, July 31st, with special consideration being given to photos received by Monday, June 30th. Due to early printer deadlines, any photos submitted after this date will be ineligible for consideration. Please do not place text or clip art on photos, as these things can be difficult to read should we need to re-size your photo. Because chosen images will be used in a printed publication, please send only high resolution/print quality images. Very small and/or distorted images will not print clearly. Photos must be submitted by pastors, congregation members/staff or associate members of LCMC. Each photo submission must be accompanied by your name, the name and location of your congregation, and a brief description of the photograph (see below for more info). How has your congregation been "in Mission for Christ" over the past year? The name of the congregation, and the city and state in which it's located. Online: Click here for an online form, which will allow you to upload a photo. Email: Attach the photos to an email and include all description information in the body of the email. Photo entries should be sent to Kristy Thomas, Communications and Public Relations Specialist for LCMC, at kristy@lcmc.net. Flickr Users: If you have a Flickr account and would like to submit your photos by sharing an album, please email a link to the album, along with the requested information, to kristy@lcmc.net. If you are submitting multiple photos this year, we highly encourage you to submit your photos using this method. Instagram: Photos uploaded to Instagram will be considered for submission when accompanied by the hashtags #lcmc and #2014agbook. As always, we plan to have videos of our 2013 Annual Gathering speakers available here later this winter. ]]> Introducing Rev. Dan Clites, LCMC's Coordinator for New Ministry Development http://www.solapublishing.com/blog/introducing-rev-dan-clites-lcmcs-coordinator-for-new-ministry-development/a357.html Mon, 04 Feb 13 00:00:00 -0700 When I was a kid, I dreamed of being an astronaut-- a bold pioneer of exploring outer space and the moon. At the time, it seemed like the coolest job ever with all its intrigue and danger. Trouble is, very few ever received the opportunity and now the whole idea of space exploration is grounded. Throughout the month of July, the staff of Lutheran Congregations in Mission for Christ has invited the members who make up our association to send us photographs depicting how they have been working as "Ambassadors for Christ" within their own congregations, within their community, or anywhere within the world. The goal? To incorporate the personal stories of our own members, rather than stock art, to depict the theme of this year's Annual Gathering, Ambassadors for Christ, throughout the Big Book that will be distributed at this year's event in October. Those who are still interested in contributing their photos for possible publication in the Annual Gathering Book are welcome to do so through the end of the day today by emailing their photographs and all accompanying information to kristy@lcmc.net. If you haven't seen it yet, feel free to check out my previous blog post for a full list of guidelines and instructions for submitting your pictures. Is anyone interested in sharing photographs from the first two meetings in 2001? If so, please email them to Kristy Thomas, LCMC Communications and Public Relations Specialist, at kristy@lcmc.net. We would love to use these photos as part of a multimedia presentation to be given at some of our upcoming LCMC events. working together to fulfill Christ's Great Commission to go and make disciples of all nations. Some have said, "LCMC is a vibrant and faithful association of congregations, rather than a denominational church body." 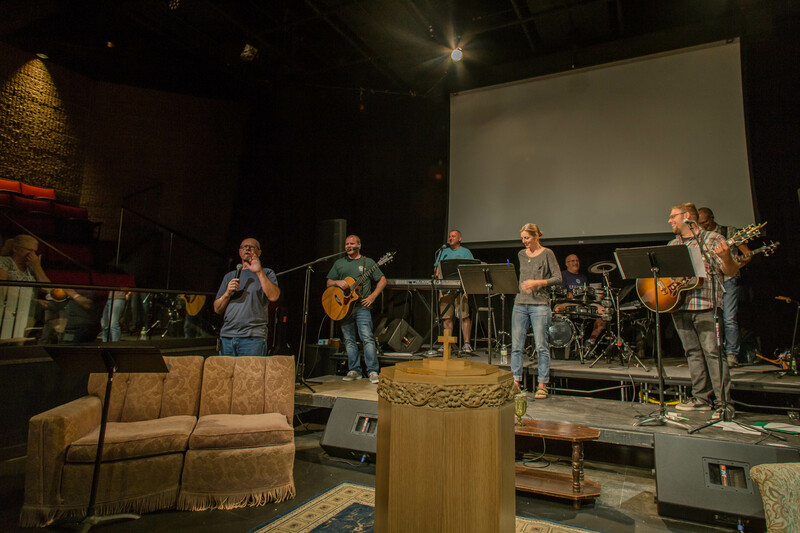 LCMC has referred to itself as "a post-denominational association of congregations," as a way of acknowledging that its horizontal structure is different than the more vertical structure of many classic denominations. But having said that, LCMC is recognized as a church body (denomination) by the IRS, by the ELCA, and by other denominations. LCMC does have structure that is defined in its Constitution and bylaws. LCMC has member congregations, association-wide meetings, a clergy List (roster), a retirement and health plan, and regional and otherwise configured Districts for congregational support. LCMC does endorse chaplains for the military and its pensions and health plans transfer. Seminary students have a candidacy process and clergy a certification process. While we understand our association to be post-denominational, we are a denomination by most societal definitions. The freedom we enjoy allows us a variety of ways of saying who we are. We are primarily Lutheran congregations in mission for Christ.